Tennyson is author of The Essential Guide to Guitar Virtuosity, which is an excellent ebook we recommend and can be downloaded from guitarspeedsecret.com. He’s just sent us this brand new lesson on hand stretches, if you like this lesson make sure you visit his site! Warming up on the guitar before starting any practice routine, or jam session is very essential, and unfortunately a lot of guitarists don’t take the time to do this. A lot of guitarists simply jump into playing, because they are so anxious to create outstanding music, but believe me when I tell you that when you take the time to warm up properly on the guitar – your playing will really flourish. 1. Why is it so important to warm up on the guitar first? Guitar playing requires a lot of looseness and flexibility of the hands. Just like any other part of your body, your hands contain many muscles, and over time, as you practice more and more, these muscles become very strong. This kind of strength comes with many years of guitar playing. This is also why it is so important to get those muscles loosened up before jumping in to any playing. The picking hand tends to develop a lot of muscle mass around the thumb, or in the meat of the palm of the hand. Its this same uber muscle strength that can limit the picking hand when you go for any kind of solo action. The picking hand also requires a lot of focused wrist movement for things like alternate picking, quick strumming, or even string skipping. The fretting hand also contains a lot of built up strength in the same area of the hand. This tends to make the fretting hand very tense, and if you want to become efficient at any technique, particularly legato, then you need to get the fluidity rolling through this hand. I don’t care who you are, both hands will remain tense from the last playing session. Getting the blood flowing through your hands isn’t all that bad. If you can discipline yourself to take ten minutes to stretch your hands, you’ll make a lot of progress when you actually sit down and practice. The best way to get your hands properly warmed up is to contort them in a way, and to hold these positions for thirty seconds to a full minute at a time. Below is a set of stretches that target all the key areas of the hands. These hand stretches should be done evenly on both hands. a) The thumb. Grip your thumb with your other hand and pull it back towards your shoulder, while keeping your other fingers extended. You don’t need to pull it too much, and you shouldn’t pull it to the point of pain. Don’t bend your thumb back too much. Simply pull it back a little and hold it in this position for thirty seconds or so. This will help to loosen the meat of the thumb. b) The wrist. Grip all of your fingers with your other hand and pull them back towards your shoulder. Again, you don’t need to over do it – simply pull back and hold for a good thirty seconds. After you have done this, take all your fingers at once, and pull them down towards the ground. You should now be bending them in the opposite direction. This will help to get the wrist lose while at the same time stretching the other muscles in your hand. c) The fingers. One at a time, grip each finger with your other hand and pull them straight out. When I say straight out, I don’t mean pull them out of your hand. You simply want to pull each finger away from your hand. You should not pull them to the point where you hear the pop of a joint. Like the other stretches, make sure to hold each finger in this position for a good thirty seconds. By gently pulling on each finger, you’ll not only create blood flow, but you’ll also release a lot of energy. Not to sound like a hippie, but its actually been proven that stretching the fingers like this releases specific types of energy. This energy typically stays built up in the hands and body, and so this acts as a sort of cleansing valve release for the hands. Once you have done these stretches with one hand, repeat them on the other hand. If for some reason you are doing these stretches before practicing the guitar, and are in the habit of working on difficult techniques, you should practice some simple and slow wrist rotation exercises. Alternate picking on one string at a very slow tempo will do it. When you are doing this, focus on your wrist rotation and making sure that the picking is cleanly striking each note. I personally like to spend ten minutes or so warming up like this, and I’ll generally do it on the Low E string, only playing one note. I’ll work on alternate picking the 3rd fret to a slow metronome beat, while working with 16ths. The speed part doesn’t matter here, as you are simply trying to get the wrist movement of the picking hand down. If you want to get the fretting hand warm up, then I would suggest working on some slow legato exercises with a metronome. Your job here is to make sure that each pull off and hammer on is strong and clear in its execution. If you take the time to warm up properly, you won’t have as much trouble making progress with speed or execution. Taking the time to do these things will have you rockin’ in the long run. 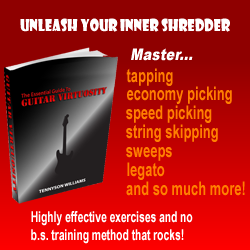 Increase your guitar speed, master the most challenging techniques, find better ways to do things, get a strong fretting hand, develop amazing dexterity and unleash your inner shredder today!